4Q18 net profit in line, helped by tax rate. CIB markets revenue were weak, posting a PBT loss. Company guides 9.5% ROE on cost savings, CIB restructuring. Trades attractively at 0.5x forward P/B and a 7% dividend. BNP Paribas (OTCQX:BNPQY) reported 4Q18 net profit of €1.4b, which was in line with consensus mostly helped by lower tax rate, while revenues were 2% lower than estimates, and costs were 1% higher. The stock has taken a beating for the past year as eurozone growth slowed and as European banks lost their competitive edge to their US counterparts. Nonetheless, BNP Paribas is on a road to recovery and presents an attractive opportunity with about 7% forward dividend yield. 4Q CIB market revenues were down 9% yoy, and PBT declined 20% yoy. This was because of weak global markets with FICC down 15% yoy and Equity/Prime Services down 70%. Global markets PBT actually posted a €225m loss. BNP Paribas updated their guidance for 2020 with 1.5%+ 2016-20 CAGR, which is lower than the 2.5%+ previous target, but it is to be expected already. They will have improved cost efficiency and CIB restructuring with ROE projected at 9.5%, which is slightly higher than consensus. Cost savings are guided to be €3.3bn vs. previous target of €2.7bn. 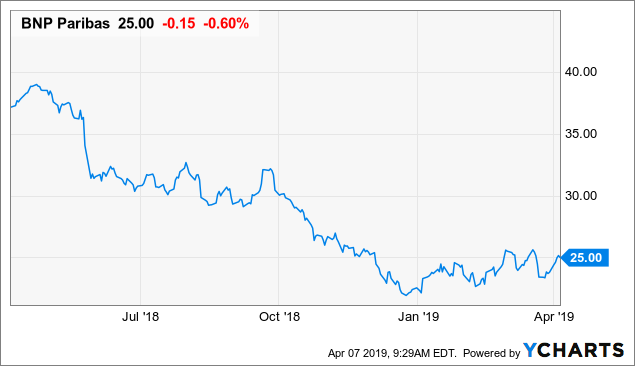 CET1 ratio stood at 11.8% at the end of 2018, or up 10bps qoq. They expect to achieve 12% by 2019.
Dividend payout is maintained at 50% cash payout ratio. BNP Paribas is trading at about 0.5x forward book value and at a low historical 5-year low. With forward ROE of 9.5%, I believe it should trade closer to its mean of 0.7x. Forward dividend yield of 7% also makes it attractive. Part of the reason it might be trading cheaply due to exposure to Italy and Turkey, which stands at ~6% of group PBT. But the bank is well-capitalized with levers such as disposals and cost savings which can help propel it back to growth and profitability.